The land of the fantastic scenery of the mountains diving into the sea, interrupted from time to time by small tiny villages, once fishermen’s refuges, still not connected by road but only by an efficient railroad. 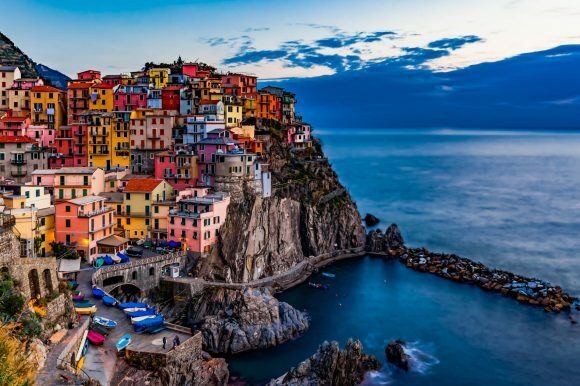 The Italian Riviera, which stretches from the French border to La Spezia, is dotted with resorts, medieval towns, and beaches. Our tour focuses on the specific area called the 5 Terre (the five lands) which has inspired Shelley, Byron, and Petrarch—among the world’s most beloved poets. Its natural beauty and tantalizing cuisine continue to intoxicate travellers. Traditionally prepared seafood, homemade pasta, and a medley of fresh vegetables and aromatic herbs make for unforgettable dining experiences. Pesto, made from locally grown basil—the best in Italy according to the locals—is the classic pasta sauce of the region. Sciacchetrà, a hard-to-find, semi-sweet dessert wine, is also a specialty. Production of this fine wine is limited due to the difficulty in harvesting from the ancient terraced vineyards. Follow us on Facebook! Free lunch. In the afternoon orientation tour of the village. Morning boat to Portovenere. Short walking tour of the town, whose highlights include the churches of San Pietro and San Lorenzo and the Genovese Doria Castle. 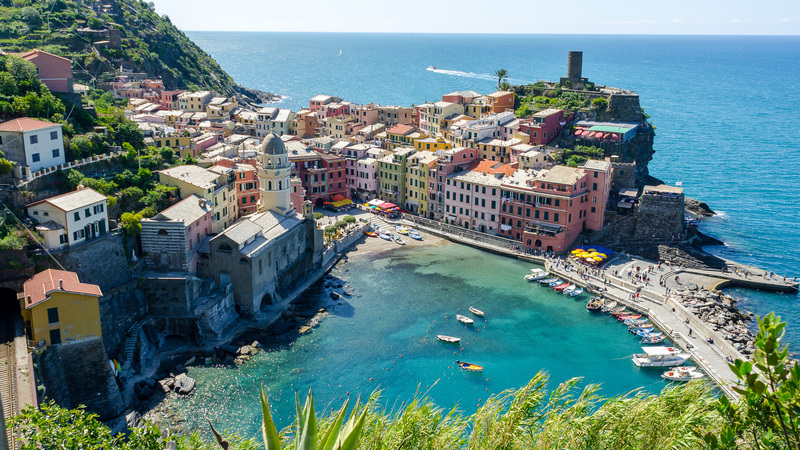 Portovenere, is a Roman-Byzantine town, where you can enjoy the view of both the sea and the nearby Apuane Mountains. 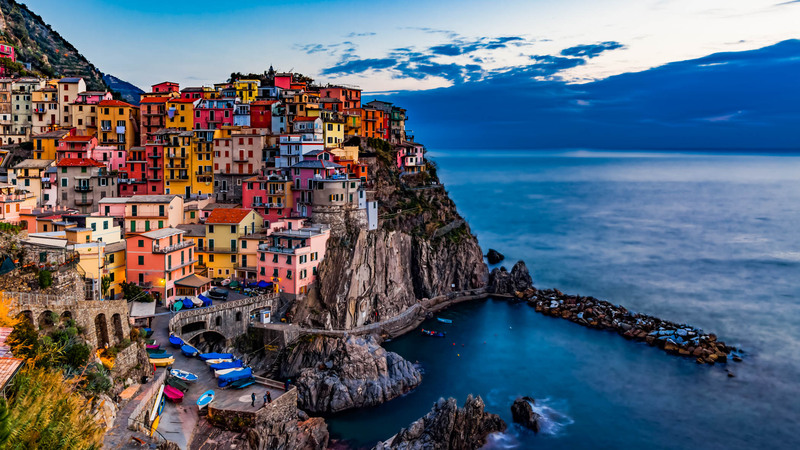 The town paints a colourful canvas against the azure sea with its orange and yellow houses tumbling down the hillside. Perched high on a rocky cape overlooking the sea is San Pietro, a 13th-century Gothic church. Its black- and white-striped exterior has made it a landmark recognizable from far out at sea. Walk from Portovenere to Riomaggiore. Afternoon, keep going and further stop in Montenero Sanctuary (no possibilities for a drink as there are no places, except water fountain). Walk further to Riomaggiore. Short ride by train to Monterosso (10minutes). Dinner in restaurant in Monterosso. Overnight hotel Villa Adriana/Monterosso. Breakfast at hotel. Short train ride to Riomaggiore. Walk from Riomaggiore to Corniglia via Volastra. Stop in the village of Groppo di Volastra for wine taste in wine cellar. Picnic lunch along the way. In the afternoon continuation towards Corniglia, ancient fishermen villages right on the edge of the sea. Once in Corniglia train ride back to Monterosso (7 minutes). Morning short train ride to the wonderful village of Corniglia. 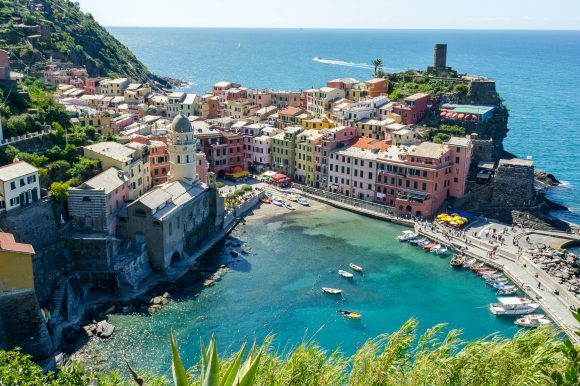 Walk from Corniglia to Monterosso via the Alta Via and the Soviore Sanctuary. Picnic lunch along the way. In the afternoon return to Monterosso. Evening: farewell dinner at “Belvedere” restaurant (or similar) in Monterosso. After breakfast, short train ride to Levanto. Short tour of the town and surroundings. Continuation by private coach to Camogli. Arrival and lunch in restaurant “La Camogliese” or similar. After lunch departure to Pisa airport and embarkaion formalities. Departure and end of our services.